CORALTAB provides Coral Calcium and Vitamin D where Coral Calcium is composed of Calcium carbonate with small amounts of magnesium and other trace minerals. Coral Calcium has a chemical structure that is very similar to the composition of human bone Calcium carbonate. Coral Calcium is similar to other sources but ensures better absorption than calcium of other Calcium carbonate origin.Vitamin D aids in the absorption of calcium from GI tract and helps to maintain calcium balance in the body. CORALTAB 500mg Tablet : Each film-coated tablet contains 1250 mg of Calcium carbonate (Coral) equivalent to 500 mg of elemental Calcium and Vitamin D3 200 IU. CORALTAB-DX 600 mg Tablet : Each film-coated tablet contains 1500 mg of Calcium carbonate (Coral) equivalent to 600 mg of elemental Calcium and Vitamin D3 400 IU. CORALTAB is used to prevent or treat low blood calcium level in people who do not get enough calcium from their diets. One tablet once or twice daily with plenty of water or as directed by the physician. Taking in full stomach ensures better absorption. For greater than 50 years patients twice daily, with food. Flatulence, diarrhoea, constipation, upper GI discomfort etc. are rare manifestation. 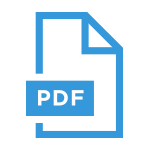 Hypercalcaemia and hypercalciuria due to prolong use has rarely been reported. CORALTAB can be given to pregnant and lactating mothers as per recommendation of physician. 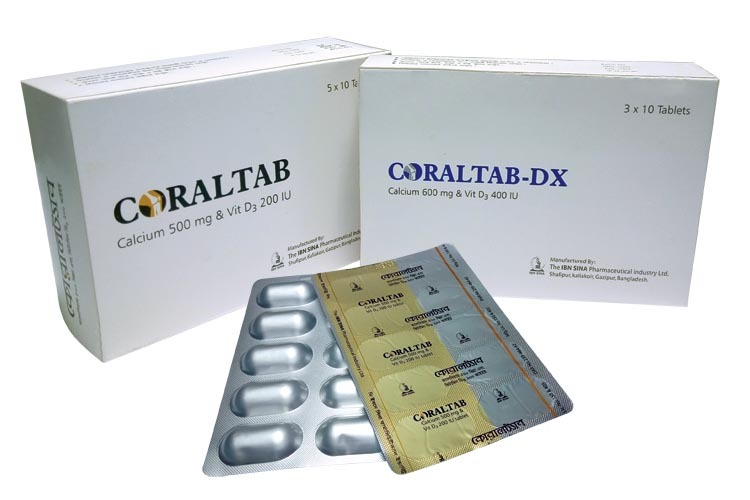 CORALTAB-DX tablet may be fetotoxic due to high amount of vitamin-D. Oral calcium can reduce the absorption of tetracycline & fluoride preparations and minimum 3 hours time should be allowed between ingestion of these medications. Thiazide diuretics reduces the renal excretion of calcium. Phenytoin, barbiturates, glucocorticoids may induce metabolism of Vitamin D. Concomitant ingestion of certain foods like spinach, cereals, milk and its derivatives may reduce the intestinal uptake of calcium. At high doses it may result in nausea, vomiting, dizziness, anorexia, abdominal cramps, headache, constipation, irritability etc. Treatment includes cessation of therapy and adequate rehydration. Protect from light. Store in dry place below 30°C. Keep out of reach of children. Hypersensitivity to any of the components, hypocalcaemia resulting from overdose of Vitamin D, hyperparathyroidism, bone metastases, severe renal insufficiency, severe hypercalciuria, renal calculi etc. CORALTAB Tablet: Each box contains 5 x 10's tablet in alu-alu blister pack. CORALTAB-DX Tablet: Each box contains 3 x 10's tablet in alu-alu blister pack.